Description: Eastbound double stack speeds accross the high desert. Description: BNSF Westbound Doublestack Train passing through Augusta, Ks. Description: BNSF Westbound Doublestack Train at Augusta, Ks. Description: BNSF Westbound Doublestack Train at Becker, NM. Description: Three birds of a different color but the same mother! 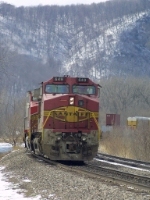 - WB intermodal flies towards La Crosse.